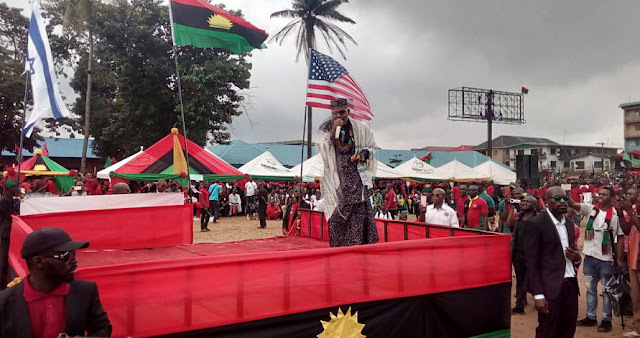 We the worldwide family of the Indigenous People of Biafra (IPOB) note with sadness and grave concern the impending catastrophic end to Nigeria unless our leader and prophet of our time Mazi Nnamdi Kanu is released from military detention and IPOB allowed conducting its referendum in peace. It should be noted that when Buhari was crying his eyes out and agonizing over whether to run for presidency for the umpteenth time; at a time when grazing reserves and cattle ranching had not even entered the lexicon of political discourse in Nigeria, Mazi Nnamdi Kanu via Radio Biafra broadcasting from London foretold what is to befall Nigeria. To put the frightening accuracy of his prophetic pronouncements in perspective, here are some of them. When IPOB came with their message of freedom and hope, some people, probably misguided by Fulani sponsored propaganda against Biafra due to their dependency on oil and gas, came up with the narrative that IPOB is preaching hate and will cause another civil war. What those that bought into the Aso Rock lies never knew was that war had already been declared by marauding Fulani terrorists under the false cover of herdsmen/farmer clash. This blatant misrepresentation is still being propagated by BBC, Bloomberg, CNN and their likes, hence the lack of urgency from international community in tackling the menace. Fulani feudal lords are not remotely worried over their open declaration and execution of a deadly covert war on the people of Middle Belt and the rest of Southern Nigeria. Whereas the likes of Ango Abdullahi, Hamza Al-Mustafa and other Northern leaders were busy castigating IPOB and calling for military action against our leader for exposing the wickedness at the heart of governance in Nigeria, they have since gone silent on the carnage their herdsmen have unleashed on innocent populations. The scriptures told us that a prophet is not recognized in his own country. That certainly is true of Mazi Nnamdi Kanu because despite his warnings, which fell on deaf ears, they accused him of planning to plunge Nigeria into war as justification for the deadly invasion of his home. What happened during the time of Noah is unfolding before our eyes. When he was building the ark, they called him all sorts of names until out of ignorance they perished in the flood that came. This same fate shall befall all Nigerians unless Nnamdi Kanu is released from military detention to lead the people to freedom and safety. Without this happening, any and every attempt to stem the tide and speed of Fulani murderous invasion will be futile. Fulani herdsmen are committing state-sponsored genocide in broad daylight in full view of the entire security machinery of Nigeria. This became possible because all security agencies are headed by Fulani men. Their stated mission is to conquer all parts of Nigeria exactly as our leader Mazi Nnamdi Kanu prophesied. Operation Python Dance II was the forerunner to Fulani invasion of the Middle Belt and Southern Nigeria. Without the military invasion Isiama Afaraukwu, Fulani terror herdsmen would never have dared launch their genocidal onslaught. Only IPOB can save those that wish to be saved before it's too late. Fulani terrorists have made Benue communities organise countless mass burials. They have walked into a Church- yes, walked straight onto a holy altar, dragged two Catholic priests celebrating mass along with 17 faithfuls and butchered them to death. Rome and Canterbury are still silent, instead we are told that Anglican Archbishop of Canterbury Welby is a close friend to Buhari. Shame on all those that conspired against the anointed one because had he been around, Fulani terrorists would not have dreamt of attacking with such impunity and ferocity. Only Mazi Nnamdi Kanu and IPOB can save the people.